Doubletree by Hilton Westerwood Spa & Golf Resort is rated 4.0 out of 5 based on 2 verified reviews from YGT customers. The golf course at the Westerwood was designed by Seve Ballesteros and Dave Thomas, and is one of the best golf courses to be opened in Scotland in recent years. The magnificent par-72 layout at Westerwood stretches through silver birches, imposing firs and the heather that is so typical of Scotland, and is without doubt one of Scotland’s best hidden gems. Thomas and Ballesteros combined their considerable expertise to create a fantastic collection of holes that will test and thrill players of varying abilities. The 4th and 6th, with their treacherously placed bunkers, are particular highlights of the course but the signature hole is without doubt the par 3 15th. Set against the backdrop of a 60-foot rock quarry face, with a devilish burn skirting the front of the putting surface, this hole is a real thrill to play. Walk off this little stunner with a par on the scorecard and you have done well. Thanks to the considerable attention paid to the smallest details, the course enjoys fantastic conditioning, most notably on the undulating moorland greens which will really test your ability to hole those nervy 3 footers for par! The Westerwood Golf Resort also offers its guests golf at the nearby course at Dullatur Golf Club. Dullatur boasts two great golf courses that have been designed by some of the games leading architects including Dave Thomas and James Braid. 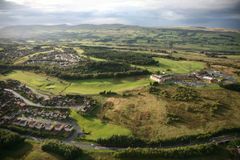 The Carrickstone course is a highly regarded James Braid layout that offers stunning views over the Kilsyth Hills and Campsie Fells. Measuring 6,202 yards from the tips, Carrickstone is by no means a long course but its undulations and well placed hazards will test players of all abilities. The Antonine course is shorter than the Carrickstone but none the less is equally challenging. This Dave Thomas design is stretched out over rolling parkland and features tricky undulations and well placed bunkers. Ditches and streams also test the golfer’s accuracy and course management skills. Dullatur also offers golfers extensive practice facilities that are perfect for warming up prior to tee off. The hotel and golf course at the Westerwood are fortunate to be situated at the base of the Campsie Hills, yet also within a short drive of both Glasgow city centre and the international airport. The hotel boasts close to 150 bedrooms, all of which are furbished to an excellent standard, as befits a purpose-built 4-star resort. The finishings are modern, and all rooms feature satellite flat screen TV, complimentary refreshments and luxury bathrooms fitted with walk-in power showers. For those who like to stay connected, complimentary WiFi is also provided throughout the hotel. The standard of the hotel is testament to a £5 million development scheme that was completed in 2007 and in its current form the Westerwood Hotel is simply perfect for a weekend golf break. The New Beauty Suite offers hotel guests the chance to relax by treating themselves to health and beauty treatments in the five fully air-conditioned rooms which are part of the luxurious Reflections Spa and Leisure facility. Those who want to unwind after a long day on the fairways can also put to use a fantastic array of leisure facilities which include a heated swimming pool, sauna, steam room and gymnasium. The most active guests may wish to take advantage of the dance classes and outdoor tennis courts. Eat at the stylish Rogano, an oyster bar in central Glasgow and for some retail therapy, head to the shopping mecca around Sauchiehall Street and Buchanan Gallery. Watch Rangers and Celtic renew the fiercest rivalry in world football in the Old Firm derby. We found the course tricky but it didn't detract from an enjoyable stay here. It is very undulating in places and I was well over my handicap. Hotel was good and the service very good. We all had great golf break at The Westerwood Hotel & Golf Resort. The weather stayed fair for us. The hotel was fantastic; service was great, food superb and a pint of beer reasonable. We ventured into Cumbernauld village both nights and found the beer very reasonably priced and local bar staff extremely friendly and helpful. The course itself was long, with some lengthy walks between holes. Our round on Saturday was bit longer than expected (some 4 and half hours). Buggies could have been an option but none available and they could only be driven on the path. Drainage on the course is a particular problem, with some work being done on a couple of holes. But all in all if the course was a dry it would be an exceptional course. In summary a fantastic weekend and we are probably looking to book again for 2013 with YGT!